I can picture him as a two year old, sitting on the kitchen floor, or perhaps in the living room, grabbing at nearby objects and putting them to his mouth. He blows hard, he blows softly, intrigued by the sounds he creates, giggling at his accomplishments and then reaching for yet another object to find yet another sound. A squeal, a honk, a gurgle, a sputter, a pop. Maybe it never happened that way but now, nearly 40, James Carter brings a wide-eyed happy explorer’s antics to his music, grabbing one horn or another (he plays every saxophone, bass clarinet and flute), and trying out yet another way to generate a sound not quite like the last--- or the next. During his recent two-night gig at the Dakota with his touring quintet, Carter often evoked the sound of electronic gadgetry with a merely acoustic arsenal, bending notes like bent circuits, pulling his octaves beyond the mere 12 tones, transforming notes into punctuation marks. Instantly we’re awed by the physicality of his musical presence—a superhuman lung capacity; an almost graceful dexterity as fingers twist and tumble over brass keys; seemingly effortless intonation at the lowest and highest realms of his horns; a reach so high into the upper range of his soprano on Django Reinhardt’s “Pour Que Ma Vie Demeure” that you fully expect your wine glass to shatter into a thousand diamonds. 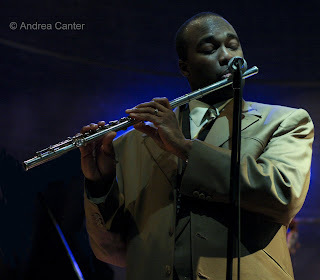 And one has to wonder if James Carter really needs his props at all, as so many of his sound effects seem to rise from within James himself, the controlled passage of air, placement of tongue, even vocalizations that vibrate against that column of steam rushing through the flute like a giant kazoo (“Dodo’s Bounce”) as if adding a reed where none belongs. With such physical capacity, one can overlook the artistic integrity Carter brings to his own compositions and covers. Like pianist Ahmad Jamal, Carter is a master of sudden changes in direction, rhythm and dynamics—he can stop on a dime and then explode as if stepping on a musical landmine. His choices of quotations are both seasonal (December audiences treated to frequent licks from “Sleigh Ride” and “Jingle Bells”) and serious (including expanding his “Bro Dolphy” with sustained passages of tango and march from Carmen), yet never musically out of place. No small part of Carter’s artistic success is his choice of bandmates, each an extension of his array of instruments, each a fellow innovator conducting sonic experiments in tandem with the leader. Not surprisingly, most hale from Detroit. Pianist Gerard Gibbs has been the core of Carter’s Organ Trio, but his higher calling appears to be acoustic piano. Throughout the two evenings, Gibbs unleashed his own menagerie of sounds, and like Carter, he doesn’t rely solely on convention—when fingertips were insufficient, he used his palms, his elbow, even his feet. But it wasn’t all fire and brimstone; lyricism and swing are fully embedded in his repertoire. 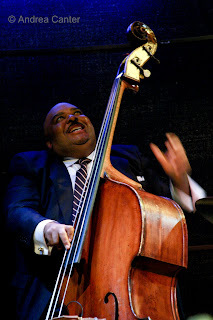 Ralphe Armstrong proved to be one of the most entertaining bassists to perform at the Dakota, one whose facial expressions were directly parallel to his wide assortment of pizzicato and arco tricks. His glissando magic often mirrored the whines, squeals and slides of the horns; with bow in hand (“Pour Que Ma Vie Demeure” and “Christmas Time Is Here”), he became another percussionist tossing snap/crackle/pops across the stage. Everyone pays attention to the bass solo when delivered by Ralphe Armstrong. 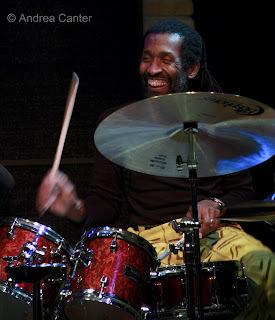 Leonard King is a long-time associate and mentor of James Carter, and the drummer recently relocated to the Twin Cities. Yet we rarely see him apart from his gigs with Carter, truly a crime as he is one of the most broadly talented and quick-thinking trapmasters around. His sustained solos were infrequent but his presence and energy never absent. On “Hymn of the Orient,” in particular, he stoked the furnace, keeping the heat on high, yet was constantly adjusting the thermostat with sudden shifts of rhythm. And no one had more fun than King. 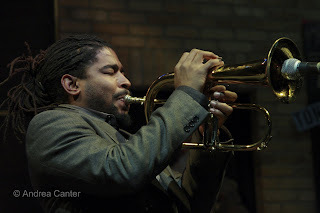 The newest addition to James Carter’s ensemble is Chicago-based, AACM trumpeter Corey Wilkes. If Hargrove and Payton led the post-Wynton generation of trumpet kings, then Sean Jones, Christian Scott and now Corey Wilkes lead the post-Hargrove surge, and Wilkes might be the baddest lion of them all. His efforts on trumpet and flugelhorn here seemed to blend Dizzy Gillespie and Lester Bowie, matching Carter’s control and innovative spirit, physical power and artistic heart. And playfulness--at one point he managed both flugelhorn and trumpet simultaeously. His tone was angular and hollow, his lines chromatic braid. One of the joys of both evenings was the jousting conversations between Carter and Wilkes, often building to a cacophony of two birds debating politics (e.g., “Hymn of the Orient” and “Anchor Man”). And no James Carter visit to the Twin Cities seems complete without a guest appearance from his “musical father,” Donald Washington, and his son Kevin. Wielding his baritone sax, the elder Washington proceeded to take apart every sound Carter could throw at him in a thirty-minute blowing session, punctuated right and left by Kevin’s fast and furious percussion. The lineage was very clear, from Donald to both James and Kevin. Carter’s most recent CD, Present Tense, strong as it is, pales in comparison to his live performances. Like the Roy Hargrove Quintet at the Dakota a few months earlier, this ensemble holds back nothing and in the process incorporates everything, every sound of the galaxy in orbit around a supernova named James Carter. Photos: (Top) James Carter; Ralphe Armstrong; Leonard King; Corey Wilkes. All from December 10, 2008 at the Dakota Jazz Club in Minneapolis by Andrea Canter.